Work for Salesforce Social Studio? "A flamboyant tool with little practical functionality"
The one thing that Social Studio has done well for us is structuring a monitoring/engagement workflow. Custom macros, classifications, and assignments are very handy to ensure we respond quickly and accurately. -Lack of basic analytic functionalities: Unable to compare segments of social activity by custom tags. We are limited to pulling exports of our various GTMs/Campaigns/etc and then must manually separate them for side-by-side comparison. Many other competitors offer an intuitive analytics dashboard that allows for easy segmentation of data and comparison. -It is clear that a social management/analytics offering was an afterthought for the larger SFDC picture. Support teams are not subject matter experts, responses are frequently re-routed and response times are long. These guys will make you wait for a response that simply disappoints and seems to dodge your question. -Can't embed video into scheduled posts....seriously? Make sure you really dig into their analytics offerings. In my personal opinion, SFDC has fallen way short in this field. Vendors like Sprout not only offer practical segmentation for your social data, but they take input from their customers very seriously (unlike Social Studio). Find a vendor that will really try to understand your needs, and change alongside you. Not a vendor that says they want to understand your needs and then does nothing to realize that commitment. We have formed a comprehensive workflow for engaging with flagged posts. If I see something of concern, I suggest a course of action, and assign that post to other relevant users for necessary approvals. Still lacks a function that allows us to easily email a flagged post of concern to a non-Social Studio user in our greater org. "Ease of scheduling to most platforms except Instagram"
I use Social Studio for scheduling Facebook, Twitter (two separate accounts), LinkedIn and Instagram posts for my organization. I like how easy the platform makes scheduling and monitoring posts. There have been times where I'll schedule a dozen tweets for one day and it's easy to drag, drop and reschedule them for another time that day, which is much easier than having to go back into each tweet and selecting a different post time. Perhaps this is a complaint for Instagram and their posting policy, not Social Studio. All I know is that it's a real pain if you're trying to schedule an Instagram post through Social Studio. You can't really schedule an Instagram post via Social Studio; it's more like just saving your content and alerting you at the proper time. Then, you're required to go into Social Studio, basically verify that the Instagram account you're trying to post to belongs to you (which, by the way, make sure your IG app is currently on the correct profile if you have multiples or you'll have to close out and try again), hit "confirm", then it brings you to a screen with all the content (photo and caption) that you previously saved to verify, except there's no easy way to just verify and post it. I always get stuck on this step and end up having to copy/paste the text into a new IG post and delete the one I scheduled via Social Studio. I'd say the ease of scheduling (minus for Instagram) is the biggest benefit. "Social Studio is good and could be so much better"
Nice experience to approve and schedule posts. The look and feel of the platform is nice enough, although awkward when trying to access monitoring profiles that are somewhat hidden in architecture. Easy to access organic metrics although still doesn't include organic impressions which is a huge miss. Friendly support staff once you get a dedicated success rep. I like the approval process and task area and the notes function should have a better email alert for team working together in the system. 90 day timeframe for all data is frustrating. Lack of impressions for metrics. Cannot connect to social advertising activity and metrics. Given the run-around when trying to re-assess for annual contract and little to no communication and no consistency with their support team. Not sure this is as sophisticated as some other platforms so if you have a very robust and varied social media program, this may not be the best solution. Ability to schedule and approve social posts for all platforms and have a record of all social media activity for legal/compliance needs. Process improvements have resulted in saving time/resources for the business. "Don’t really care much for it"
It has a hefty amount of tools at your disposal. They can vary all the way from social media management to outreach. Using it to manage Facebook and Instagram was easy enough but once you get into other social networks it can get better. Our team did not like it and opted to go with marketo instead. Salesforce can be a bit tedious in its software updating and it’s pricing. It can be a little overwhelming because of how many features it has. Give it time if you have it but don’t deploy it on a whim. It takes a bit to learn by once you do, you’ll get a better understanding on what to do and how to use it efficiently. Just give it time. Benefits are better social media marketing management. "Disappointing, to say the least"
Social Studio is a great tool for organizations who are already deeply committed to the Salesforce enterprise and want something that easily works within that without paying for another tool. I would not recommend this tool for large organizations, but think it would be a solid next step from a Hootsuite or SproutSocial for a medium sized company. Pretty much everything. Social Studio has a really small maximum file upload limit, doesn't allow posting videos to Instagram (which is really disappointing since Zuckerberg has stated that video is the new mobile) and doesn't allow you to edit posts once they have gone live within Social Studio. This is a great tool as a next step for a medium sized company looking to upgrade from a Hootsuite or SproutSocial type program. We used Social Studio for social media management, monitoring and analytics. The only real benefit is that if you're committed to staying within the Salesforce ecosystem, this (obviously) fits in. For example, if your Customer Care team is also using Salesforce, it's very easy to kick over any issues to them. Further, the Advertising Suite within Social Studio allows you to better align your paid media efforts with information collected in your CRM in a turn key manner. I like the ease of posting to several different social media accounts, especially in a hurry. It no longer allows me to tag other accounts easily on Twitter, which is largely why I don't use it much anymore. It allows me to post quickly and on multiple platforms. When I need to get a message out quickly, I use Social Studio as opposed to going to each channel. It does not matter which browser you or your company use, which is nice! Internet Explorer, Chrome, or Opera, all of them. This makes very easy to use Social media function like Chatter, which can help businesses find collaboration. Looking like popular social media makes it very familiar and easy to understand for users. Functionality like news viewing, status updates, links sharing, and files uploading is available right from the dashboard. You also do not have to install any software. There are no hardware requirements either. Social listening in the engagement tab is very helpful for our team! It's best for multiple accounts on Twitter and managing pages on Facebook. The columns in the Engagement tab are great, but you have to tell it EXACTLY what you want and anything that you might want to see. It helps us know what people are saying about our brand even when they don't tag us. It's great for a team and managing multiple accounts. Re-purposing content that was posted the year before is a great benefit! "Good, basic tool with promises of a big future"
If you're used to other management platforms, you'll feel comfortable using Social Studio. It's pretty user friendly and doesn't take much to get up and running. I trained multiple groups of people with varying levels of technology experience and they all understood the platform quite quickly. Being able to see the analytics within the analyze tab is GREAT! No longer do you need to go our to Radian6 for basic listening data. Shared content is an email inbox life saver! It allows me to share photos, links, quotes, etc with many different users across our organization AND I get to see who used it and when, what site they posted it on, and what the engagement rate was with each shared post. Don't trust the sentiment rating (although it's rumored this is going to be updated soon so you can train it). People tweet "I would kill to go to Pepperdine" and sentiment robot rates that as a negative. Or anything with the words "shot" (think how many tweets from sports teams have that included...) are all listed as negative. When/if they is updated to be trainable it will be a great tool. Right now, it's just a data set I don't look at. I'm noticing as I complete this review, the Social Analytics Features portion of this review, Social Studio doesn't have those options available... yet. When you're talking to Salesforce, ask for a conversation (or two) with current Social Studio users. I am more than happy to provide demos for Salesforce and I'm honest about what I like and don't like. Also remember, this product is VERY new to Salesforce and the marketing cloud in general is pretty new. That's a good and bad thing. Bad in that the product needs to be purchased on vision and the hope/knowledge they will be improving the product. It's a good thing because you're in on the ground floor of this soon to be HUGE social media player and can help influence the changes and product offerings. That's exciting. We are able to listen much more effectively across multiple platforms. When monitoring a crisis, the word cloud gave us insight into what words we should also be monitoring that we hadn't thought of yet. It's an invaluable tool for keeping up with what is happening around the internet regarding our brand. I like social studio because it helps me keep my clients and potential clients organized. I like the social analytics features that can be created for each client specific to their analytical needs. I wish that there was a quick view to hover over contacts, instead of having to click into each profile. I would recommend making a contact at Salesforce. They can help create a custom platform for our social needs specific to your company. My company keeps all of the client contacts on Social Studio. We can easy view if other employees have the same contacts and can share contacts with each other easily. It is an organized and accessible software for social needs. "It's the new cool kid in school." The user interface. Unlike the Engagement Console and Radian6 both on website and in the app, the overall feel of the UI is pretty good. It's also pretty attractive from a client's perspective. There are still a lot of things that the Engagement Console can do that Social Studio still can't do well. If all of the features of EC will be transitioned to Social Studio in the next few releases, I'll be happy. If you have a business size that is anywhere from medium to large and you are looking for an all-in-one tool when it comes to engagement and analytics, Social Studio is the way to go. It is excellent in publishing as it has basic editing and publishing features that you cannot find in any other tool of its caliber. Engagement is also good as it can address trails of conversation with macros and tagging for social media reports easy to complete and manage. Social Studio is primarily used by our company to schedule posts on our social media pages. I also train people to use and apply Social Studio for customer engagement and social media publishing. "A versatile tool for planning content schedules"
The ability to see a calendar of the week and all of the posts you have already published or have scheduled to be published in the future. In addition, being able to easily reschedule posts just by dragging and dropping them is extremely useful, and new tools constantly seem to be introduced to make planning content an easier experience. Random bugs will pop up from time to time and take months to be resolved. Also, the tracking tools that are included for monitoring posts on the various social networks aren't all that powerful, especially when it comes to analytics. We find the native tools within each social network to be easier to use and able to provide better and more in-depth information. If your primary focus is in-depth analytics or monitoring what is being said about your company by users or tracking hashtags, there are probably more advanced products out there. If your main concern is an easy way to plan and schedule content, however, it doesn't get much better than Social Studio. It makes life much easier when it comes to scheduling posts across networks and being able to move things around within a content calendar. More than anything, we're solving the issue of being able to plan content for social media out well ahead of time in a straightforward, easy-to-view dashboard. We also have the ability to collaborate and assign tasks, track analytics and monitor what users are saying. "Sales Force Social Studio: Definitely Easy to Use, and Recommended for Digital Marketeers!" Easy to use due to user-friendly commands and instructions/tips that are available. Needs strong and fast internet connection to work smoothly. Crashing is, at times, often experienced. This is one of the hurdles all the groups encountered during our training in Nestle Business University which was held in 5-star hotel with good net connection. As soon as all the members of each of the 5 groups started logging in and testing radian6, this notice would start popping up "radian6 is not responding and need to recover page". If not this, page will crash and we ended up creating a new profile name for the group since the previous ones we did were not saved causing a lot of inefficiency on our end. And lastly, uploading is delayed even if image size of the attachment is small. This causes discrepancies when needed reports have to be generated real-time. Perhaps, a hard copy manual can be given since this can be shared to interested users as well. Prior to using Social Studio, I always thought that such tools can only be used by expert and trained digital marketing peeps who have undergone a separate study course. But after getting familiarised with Social Studio, I can now do my own monitoring and bench marking of my brands, activities, campaigns, etc. versus the industry, competitors, etc. This is definitely a huge held and a must-have for those out there who share the same dilemma as mine before. So check this tool out and you will be surprised how easy your job can be from now on. Monitoring of brand campaigns and activities launched vis-a-vis competitors, and sales impact. "social studio review midtown art cinema"
I like I can schedule out posts. so I can set up a week in advance. i see how this is very useful for a large company with multiple accounts. a lot. I see where this is useful for a central office handling multiple pages and accounts. but for the single location it misses the fun and interactive nature of face book. sharing posts that give a more personal touch and customer interaction is lost. lets say I see something I want to share. I have to copy the link log into social studio, paste, and hope it interacts properly. sometimes the post shows up right other times just shows the link. I don't like that I cannon create event pages specific for my location, I don't like that I cannot change our banner picture. or our profile picture. face book is supposed to be organic and engaging our customers in a fun and personal way. instread I feel we are just another corperate page. I just feel it does not have the organic nature that makes facebook fun and easy to use. I used our account to answer customer questions. I use face book to notify our public of special events special screenings. guest speakers. I used it to create a fun movie conversation not just about our films but films in general. to engage our audience. "A move in the right direction for Salesforce"
The clean and cohesive interface. Gone are the clunky dashboards that you had to build from scratch. Gone is the separate Engagement Console that you needed to download and pray your java supported. Social Studio integrates everything in one aesthetically pleasing in-browser package. Publishing, engagement, and social analytics now all share one cohesive URL and interface. It is easy to go from scheduling posts, engaging with consumers, to viewing topic trends and sentiment all without leaving a single URL. This is a massive step in the right direction for Salesforce's social tool. The engagement feature has gone from a hassle in the old Radian6 to something that is downright easy to use. The current limited functionality. Currently the analytics dashboard is comprised of pre-built widgets that provide you with little to no customization options. You have widgets based on topic trends, word clouds, sentiment, top languages/countries, and keyword groups, but you can do little to nothing to customize them. The most glaring missing feature for me is the lack of drill-down filtering (like running a volume trend chart off of a single word in the word cloud). All the widgets are pretty much WYSIWYG, so it's essentially a dumbed-down, pre-built, prettier version of what you could create in the older Radian6 dashboards. Your ad execs may love how easy it is to glance at some graphs, but the data geeks like myself may be disappointed by the lack of features. The good news is, I have seen a preview of the Social Studio roadmap, and it looks like customization and drill-down features are on their way. I often train business users on how to properly utilize both the Radian6 dashboards and the Radian6 Engagement Console. The problem has always been that two tool barely seem connected, and it was like training users on entirely separate systems. The new Social Studio will be much easier to train users on across the board, due to it's homogenized interface across the board. For our social analytics reporting we have had to continue to use the legacy Radian6 due to it's more customizable widgets, but once Social Studio catches up in that regard it will be an improvement in every way. "Social Studio streamlines success in Social Media." I like the easy to follow and dynamic feeds. The general design allows those who are not very familiar with such tools to easily catch on, and quickly become productive. The tools available are also numerous and with a surprising amount of depth. Social Studio truly makes the experience of reaching into the social world a much simpler concept; this means working as a team has never been easier. The amount of time it takes for feeds to load, and the amount of times I've attempted to click one button and it does something completely different. In the social world, something as simple as liking a negative status can set off negative results like a fire-cracker. There is really zero room to have error when processing social interactions. This is fortunately not entirely that common, but it is disheartening. Overall, small technical issues aside, the only true criticism I have is that it would benefit to expand the social analytic tools. Although they provide a lot of useful information, the ability to tie down some specific information is limited, and could use for some expansion. Try it out! I haven't seen any tool make it as simple as Social Studio. That is to say, it works best when working hand in hand with other more in depth tools. We are finally able to make Social Media a much more streamlined and measurable form of customer service. It can difficult to take social feedback from a customer and design a work flow behind that, especially day by day. Social Studio has been the best platform I have seen at providing a way to present this feedback in a manageable way, to then set up a standard on how to interact. Social Studio has also benefited us in providing a very visually appealing and easy to follow form of analytics. It's easy to manage multiple social media restaurant pages at the same time, and to see all engagements, comments, posts, likes etc. The Social Studio team is also helpful when asked questions or when the team needs help. I also like that I can easily see content posted to both Facebook and Twitter in one place. - Can't tag users or other pages in a Facebook posts. This is a major miss for a brand, specially when wanted to increase engagement on these channels. - It's difficult to pull/understand metrics; I always need to reach out to the team for help. it isn't very user friendly. - Post often fail to publish to social media pages. I always receive emails saying that our content has failed to publish but there is never any reasoning behind it as to why. Often when I attempt to re-post the content, it fails once again. This isn't reliable and a little worrisome when we have content schedule to go out over the weekend and it may not actually publish. Customer service via social media (Twitter and Facebook) is one of the main way we use this platform. It's easy to see all posts in one place for hundreds of Facebook pages, as well as for different platforms. This helps us to respond to everyone in a timely manner and avoid missing any comments or questions that come through on these platforms. "Very convenient and easy to understand tool"
To be able to monitor all the my social account in the same page/dashboard. Makes monitoring much easier as you do not need to switch between screens/tabs in order to monitor each account individually. Lacks the feature for Engage section where you can review and approve messages done by others before they proceed to post. Current function does not allow this. It's a good all in one tool to monitor, analyze and continually optimized all of your social media platforms/accounts in one place. Looking for how much people are talking about my brands compared to my competitors and also social customer care. By comparing to competitors I can observe what the competitor is doing right or wrong and learn from that. For social customer care, it allows me to get consumers feedbacks/comments much faster especially when the comments made was not within my owned social platforms. "It has greatly reduced the amount of time needed to spend on customer service cases - when it works." The ability to create case in Salesforce Service Cloud with the push of a button. Also, the ability to monitor multiple social channels simultaneously, in real time. The functionality of publishing posts on Facebook is not as sophisticated or robust as publishing through the native Facebook platform, so I find that we are only using the Publish section for Twitter. Also, the mobile app does not seem to update as regularly as the desktop version, and there is a delay in the Twitter feed on the app. We have also been having an issue with our Facebook feed - the feed has not updated in over 3 days and we haven't been able to get a solution from the service team on how or when this will be fixed, making it impossible to send cases from Facebook (our highest volume platform) to the Service Cloud. Make sure that you have the time and the IT resources necessary to get the integration with the Service Cloud up and running. It took some time, but was well worth it in the end. The need to monitor our social platforms in real-time to engage with our customers and help solve their issues. It has dramatically decreased the time spent on creating cases in the service cloud. We also have multiple brands which we need to constantly monitor, so this tool really helps us to monitor all brands simultaneously without needing to sign in and out of accounts to reply and engage with our customers. "Social Studio, one of the best in class world scale social capability"
1- Scalability & coverage: Social Studio is a world leading social tool. It totally address and scale social requirements for any worldwide enterprise (either you are in Russia, China or USA). To be precise, my company was able to deploy this tool on more than 30 countries on the majority of the languages, the social networks and with several SF.com consultants & partners covering the setup and trainings. 2- Capabilities: since 1 year, we can easily use social studio to listen a wide range of sources (it fits our needs and is aligned with competition, while Radian6 was too complex at its time). We also use Social Studio for social response & consumer care engagement. Finally, we leverage the social publishing part which is as well fitting our marketing needs. Social Studio cover all social scenarios but seems not the best in class in each of the capability (listening, response, publishing, etc.). It is one of the best solution for a worldwide business with general needs, but here are 2 examples: it will not fit specific detailed and complex listening scenarios ; and it will not cover ALL chinese social network for the response part ; etc. We discovered competitors that can address specific cases better then, and we use them in some markets over the world. - Make sure you specifically cover your listening requirements. - My company is now able to easily deploy social listening & social consumer care capabilities over each country in a couple of weeks. - We manage more social pages in more social networks; we need less people to manage more pages! - We can target, translate and localize our posts in Facebook, in a same page for several countries and languages. I like the purity and simplicity of the graphical interface of Social Studio. I also love the ability to have all conversations on brands and products in a single access point. Unfortunately in Italian detecting sentiment is not easy. Even the computing power and the speed of execution are really valuable and useful. The platform is not easy to use at all. Even after attending the basic courses its use remains for me very mysterious and confused. Even with the use of relevant parameters the platform is also likely to produce a huge quantity of results, even inaccurate, that sometimes saturate all the capacity available. Make sure you have studied the platform before its actual use. You may have problems: too many useless conversations to analyze and too much time required to analyze the volume of subimitted queries. Surely you have to do a very accurate initial segmentation. Right now, for my position as web sales manager, I could not solve any problems. In fact, the output of your solution would be more useful to our social network managers, who will have charge of monitoring the conversations and sentiment, also associated with our products and offers. Comprehensive feature set for Publish, Engage and Analyze with sophisticated design. Users could easily understand how to publish, engage via Social Studio therefore businesses would be able to realize its value quickly. No critical dislike point and I could recommend it with confidence. Some features including the following list would be welcomed. - Improvement in Topic Profile keyword settings. Highly recommended. Once experienced you would be able to find that you could implement overall workflow for publish, engage, performance report quite easily with its feature set so focus on achieve your target with social media campaign. Many aspects including social account management, team workflow and compliance. One of values realized most quickly is reducing risks with social account management by deleting personal staff Facebook account from Facebook page managers. Approval feature enables our customers to introduce content review process, which is required by internal rules, so they could start social media campaign. "All around great platform w/ few downfalls!" Combining the magic of Radian 6 monitoring with a platform that has it (almost) all was genius. It encompasses all the needs of a brand into a single platform. There have been a few issues where not everything pulls in, but I'm assuming that is a typical API problem. It is still better than 99.9% of the other platforms. In addition, there is no way to "Assign" an item of content to multiple people - only a single user. Analytic feeds are not completely export-able, only a select part of them. Give it a try - there's not much that it doesn't do. Their connection with Radian 6 (same pulling system) is unmatchable for organic mentions. Listen to everything people are saying about your brand - not just the portion that they mention you in. Not a direct brand - but overall is simplifies the process for us as well. Less need for multiple programs. The ability to schedule posts on multiple platforms, the changes made have vastly improved this exerience from when it was first released and this aspect of the tool are great to use. The engage console part is clunky and macros need to be much more easily accessible and replicate the engagement console. As is we are still using the engagement console, as social studio does not provide the ability to easily create macros, tag and view like the old engagement console does. A much better interface and workflow is needed. Also sometimes the loading times are very slow for social studio. No ability to schedule content on Instagram is a downfall, though I know the company are hard about releasing the API to do so. Not being able to promote posts via scheduling through social studio is a real downfall for us and it means we cannot schedule any Facebook content from Social Studio that needs to be promoted. While it still needs some improvements with its capabilities, it's a great tool to schedule Twitter content, and manager calendars. We are trying to prevent crisis issues before they hit our pages by montioring keywords, as social studio is currently, it is not the best way to do this and we prefer the engagement console. Scheduling content has been great as it takes the ease off our time ensuring posts have gone live. "Always been happy with Social Studio"
The dashboard and having all the topics in a very easy to view, its also very easy to customise and I like that its web based rather than the old R6 which required installation to your computer. "Social Studio has proven to be a valuable listening tool. It's engagement capacity has been limited "
The ability to provide a direct view of Social Media and Topic Profile feeds. Ease of setting up new users. Ensure you get a real world view of how this can assist you on a daily basis. Ensure all features spruiked during initial consult are fully explained and demonstrated. At this time Social Studio is only helping us in a listening capacity. We had planned to use the program to replace existing Instagram engagement platforms. "Social Studio is a useful platform for News rooms but there are areas that need work. " When you need to schedule multiple posts of the same/similar content, you can copy a post you've already scheduled. It makes things so much easier. The performance analytics are a great feature as well. At a glance, I can see how well our post did for the week. Right now, it's only Facebook and Twitter we can post to and only Facebook we can see the analytics for (it's been explained that Twitter has their own rules for sharing their performance data). It would be good for the future to include instagram, Youtube, google+, and other social media sites to post to and look at the performances of each. Definitely check your post performances at least weekly. It will give you a good idea of how you can improve your posts, what your reach is, and what your audience likes to see (based on post reach, comments/likes/shares). It's easier to see what posts reach our viewers more and which posts need work. That's definitely been a huge plus. We've started revamping how we post to social media, the kind of phrasing we use, to make things more engaging for our audience. It is pretty simple to use and it have intuitive interface, so you don't need previous experience or training. As they say by them self, browser experience is currently best on your desktop. Currently here means last several years. Opening web page on phone is practically impossible and Android app is not much useful either as it lack some of functions. Tagging is still pretty slow process since it will save all tags, with and without mistakes and auto-suggest them every time you doing this. Limited video formats which you can upload. It is easy to use and fulfills basic needs in costumer support and content posting. Content Leader for Social networks and Customer Service representative. It gathers all so you have all your channels in one place which means faster responding. What I like the best about Social Studio is the accessibility it offers, I found it to be quite easy to get around, simple yet detailed. The only thing I dislike is sometimes it was a pain to memorize steps on how to close cases, sometimes they wouldn't close, so had to do it twice. I would recommend definitely giving it a try! The support is great, so if you have any questions I'm sure SS can help you solve it. We're able to get to the customers that matter, going through the clutter, pinpointing customers that spend money on our product and solving their issue. Sometimes we have campaigns that backfire so it's easy to create a column for that topic and manage it that way versus doing it natively, cuts back on time for community managers too. Assigning a sentiment also helps track where the online conversation is going, enabling us to edit our strategy as needed. "Decent Multi-Featured Tool for High-Level Monitoring/Engagement"
The overall simplicity and look/feel, along with the tool's speed. It performs tasks and updates data/dashboards much quicker than the traditional Radian6 analysis dashboards. Coming from the traditional Radian6 analysis platform, this tool is rather limited. To its credit there is the added engagement/monitoring features, but the listening features are a bit lacking. Not enough room for customization in terms of widgets and analysis dashboards. Determine what your specific needs are for social listening and management. There are tons of tools that do either one or the other, and tons of tools that claim to do both, but only a few actually do both well and YMMV depending on your specific needs. Monitoring B2B tech trends across a variety of verticals and industries. Compared to the traditional Radian6 analysis dashboards, Social Studio makes it much easier to quickly jump in and get a feel for the conversations. "User friendly - Simple tool"
The publishing aspect of Social Studio is simple to use and convenient for scheduling posts ahead of time. While the publishing part is easy to use, it has limitations. It's incapable of sharing multiple photos and videos over 15 MB are too large to share. So if you plan on having a content mix, this may not be the tool for you. If you are looking for just a basic tool, this one is pretty good. But if you're looking for more advanced social listening, I'd go with something else. We're a marketing team that does EVERYTHING in-house for our company, so we're looking for a social tool that delivers publishing, social listening and reporting. Like I mentioned before, the tool is very user friendly. "Monitor who is talking about you"
You can choose which social media profiles on different platforms (Facebook, Twitter, Linkedin, etc) you want to follow, and then filter them to only see posts from those people when they are mentioning you or your brand or a certain topic. This is a really helpful way to see what is being said about you without having to spend a ton of time on social media. You can also use it to post to different channels and respond to posts all from one place. The cost is pretty high if you are not using all of the functionality. There are other, less expensive tools to use if you just want a central place from which to create and post to social media. The value is more in using Social Studio for listening to what is happening on social media and then responding to it. Listening to what elected officials are posting on topics of that are of interest to us, so that we can be proactive about responding to or engaging those leaders. "Social Studio is great for organizing all social accounts in one place, but there are some flaws"
Social Studio is something I started working with this year, and when you get past the learning curve, it's been pretty useful. I love that you can access all the social accounts from one place and get nice eye catching analytics that can be displayed. Social studio has a hard time compiling threads and conversations, so it's hard to tell if you're responding to the latest comment or if one comment in a thread relates to the other. Would also like to be able to create dashboards from the mobile app. We needed a more hands on approach to social and a way to display it to our company and I think Social Studio accomplishes that. "We currently use Social Studio for our Complete Nutrition Stores." I do like that it attempts to provide a one stop shop for our social network platforms. Currently for the price we are not getting much out of this program. We are not able to manage much of the program on our end (this may be because corporate office does not grant or it may be the platform. For example we would like to add additional competitors to hear what local competition is doing in our field, but are very limited in this capacity. Also, most of the "listening" is generic and does not provide us with much insight as to what people are saying about our market specifically. We like the idea of being able to manage our Instagram account on the platform, but were told that this too would be an additional expense and we have not seen the benefit to warrant an additional expense. Again, unsure if the limited functionality is corporate mandated or if it is from the program itself. We really get most of our functionality from the social platforms themselves. For example, Facebook provides good analytic to tell how how well we are reaching people. Honestly, none really. We have become frustrated and do not utilize social studio that often. We do see where there could be some benefit is being able to track local competitors and what is being said about them, but as stated earlier we have been unable to narrow things down to a local level that gives us this insight. "Good for scheduling -- not managing content development workflow/approvals"
I was working for a company that housed several different brands. Each had their own social media channels to manage -- some with separate pages for different countries. This tool was good for allowing each brand manager to manage the scheduling of content publication and sponsored posts, and be able to view the performance of different types of content. It was also key for our community manager to be able to spot any customer service issues that were going on that day quickly, and be able to help point those customers in the right direction. It took a lot of manual tasks off of our brand managers' plates. I wish there were a better way to manage content creation and workflow (approvals) from within the tool. We still had to use a separate project management tool to gather up all of the assets we needed each month. Since there is no good way in Social Studio for managers/approvers to see all of the content (without individually clicking into each post), we ended up still using a spreadsheet to manage editorial calendars for that purpose. It's not great for companies with multiple layers of approvals. I also remember running into snags with YouTube and Google + integration. Also, we were big Instagram users, and at the time, there was no Instagram integration. So, that still had to be manual. This tool may not be for you if your content needs to go through multiple layers of approvals. Best for companies who have very adequate content editors and community managers, who can QA before content goes live. It's not a great tool for pushing content through the development cycle and gathering assets, so be prepared to continue using your existing project management system for that. Our team was having to manually enter content into each channel, and this took away some of that manual work since posts can be duplicated. We also initially had no good way of seeing how our social outreach was performing, but by using SS we could easily see at-a-glance which posts (and categories) were performing well, so we could optimize our content each month. Our community manager also no longer had to check each channel every morning for customer complaints; they were all in one place, and could be addressed more quickly and easily. The fact that is it web-based so I can access it from anywhere I have an internet connection. I am also able to customize my tabs so I can easily organize my day and follow up when needed. I am engaging with customers through social media on a daily basis. I am able to respond to questions and concerns quickly and accurately. I am also able to circumvent calls into our call center by answering simple questions or communicating information about the status of our network. "Easy deployment and intuitive customization"
We were up and running in 2 days and were able to match the functionality of our Sprinklr deployment in less than a week. limited reporting suite. The default reports are great and widgets are easy to deploy. Just need more customization. Publisher requires separate post to each platform, rather than an all-in-one editor. take advantage of the premier support. The accelerators are second to none. We use this for all Social Listening and engagement as well as organic social. Mainly use it for social listening, it gives you great statistics and feedback live. It is very easy to use and to interact with other team members. Unfortunately, there are things that need polishing, such as reporting, and some information does not show up when monitoring. The main problem is SPAM (or irrelevant) information that gets generated. In my previous position, the majority of my experience with Social Studio was on the Engage side. This tool bridged the gap between our external warranty center and internal escalations team and streamlined contact with our social agency. We were able to optimize the Topic Profile for customer service posts and use Social Hub to automatically route these to the appropriate individuals. It was like we found the missing piece to the puzzle to align the workflow between these groups. In my current position, I am gaining a more complete perspective of the tool. I like being able to use labels when publishing to inform future content, to create Topic Profiles within Social Studio rather than Radian6, and to view/customize Analyze dashboards on demand based on social accounts or Topic Profiles as well as time frame. I have been consistently using Social Studio since September 2014 and have experienced a few issues with functionality (Ex: photos not showing up in columns, inability to post from a social account, etc). These issues have been addressed promptly by Marketing Cloud Support. I have also expressed interest in features that do not yet exist (Ex: approval workflow for Engage, ability to pause a column overnight, etc). The Salesforce team I work with is awesome, and I am confident that this tool will continue to evolve. I appreciate the increased functionality and updates as they are implemented. I have direct experience with aligning workflows for a better customer experience and issue resolution on Facebook and Twitter. We are also using labels on these product and service related posts to identify potential emerging issues. Moving forward, I will be working with our business units along with our Salesforce team to improve online reputation with the help of Social Studio. "Social Studio: Solid sCRM platform"
I love the integration with the marketing cloud, the ability to create custom audiences and just how your social engagement strategy can expand into a paid, CRM, analytics and listen,ing strategy....Not only a solid publishing and engagement platform but generally how social studio can enhance your entire customer journey within digital strategy itself. If you're already a SFDC customer, go for it. It makes sense for your long term digital and demand strategies. Governance, consistency and great tool for always on engagement. "Social Studio is good, but not great." The real-world preview of your post so you know what it will look like when you publish. Performance of the platform is also pretty good. Time/Date don't copy over when you duplicate your post. No bulk scheduling -- need to create calendar of posts offline and then upload to Publish calendar. Depends on your scale -- easy to add users, but they're licensed by the account, not the user. So if you have a lot of users but not a lot of accounts, the price will be better. They are still integrating Radian6 into the platform -- until all the functionality of R6 is included, it will continue to be ranked poorly on the Social Analytics side. Centralized access to social channels. Distributed authorship. Secured account credentials. The Social Studio tool's ability to connect campaigns and advertising abilities across platforms to enhance customer experience, and better target customer engagement. The features of some of the social media tools are not yet available in Social Studio. It would be great to get timelines on these. Solving for social commerce and tying paid advertising on social media with our e-commerce tools and marketing automation. Social studio has an easy-to-learn layout and provides me with useful analytics. When you have multiple accounts and platforms on it, Social Studio becomes very slow. I experience bugs all the time, where it will not save aspects of my posts, or it won't allow me to tag the proper Facebook page in a post. Additionally, the formatting can come out strangely at times. I also wish I could share posts and content that has already been posted. We use it to schedule social posts and look at how well our organic posts performed. "Making the most of Social Studio"
The integrated calendar is very easy to work with. It makes adding new posts and not having conflicting content manageable. Take the time to read through how to use the product. Understanding this will further help you advance your content quality. Working for a large corporation where brand identity is huge, this streamlines the efforts of many people into one location. Social Studio provides this as an exceptional opportunity. "Easy tool for social media monitoring and management. " The ability to schedule (Facebook and Twitter) is extremely useful for us. Management of content via the content calendar makes it easy for us to keep track of all channels in a simple format. The workflow approval process is also exceptional in ensuring we schedule final content with our agency. The inability to schedule Instagram posts is extremely frustrating. We would also like the ability to 'drag and drop' notes or content within the calendar rather than clicking on each piece and scheduling manually. The inability to upload a custom thumbnail for our videos also makes it hard to use SS at times so we need to resort to Facebook or Twitter for scheduling. Dark posts on Facebook (ads that are not posted on our FB page) are not pulled through and this makes it difficult to monitor with us having to go into Facebook and click through notifications instead. We were promised this and it still hasn't been delivered. Once the ability to use this tool is grasped, it will make daily social media managements extremely easy with social listening to benefit your ability to reach out to your target audience. The management of social content with the ability to schedule content when our target audience is online. Social listening has also been beneficial when explaining the benefits of social media to stakeholders- which is still a very new concept for the organisation. Social studio allows us to manage multiple business units with multiple social presences all in one place. The seamless integration with the platforms is a distinct advantage over other products. Radian6 Topic Profile integration within the ios app is also incredibly convenient. Workflow setup is intuitive and extremely effective in a team environment where many may be posting to several accounts. Also, the ability to tie stock photo accounts to Social Studio accounts is a distinct advantage. I have just a couple minor dislikes. Social data gathered on customers doesn't integrate into any other databases within the Salesforce Marketing Cloud. Also, sometimes links posted from within the app don't pull the same links in production then they did during the scheduling process. Really, my only serious issue with Social Studio is that it is a good deal more expensive than it's competitors, like Hootsuite. However, if it tied customer data gathered at other points (email, predictive) and integrated a full view of the customer into one place in the Salesforce Marketing Cloud, it would be a good value as a package. There are constant enhancements and it is always getting better and more sophisticated. My number one recommendation would be use the workflow, even if you don't think you need to. It isn't worth the risk. Use the conveniences that Social Studio offers like the tied stock photo accounts. The biggest benefit we've seen is the management of many business units, many social accounts, and many users. The workflow is great and training is very easy because of the intuitive nature of the system. We also use Radian6, which while is incredibly complex and more challenging to master, is an invaluable social listening tool. Our company has been able to quickly address customer service issues as well as give feedback on conversations surrounding our brand. The "duplicate post" feature is such a simple yet incredible tool! It saves so much time to be able to "duplicate" a past post that already has the links, google analytics, hashtags, etc. that I need and I can quickly modify the copy and image and schedule for another time. Having only two social accounts per workspace can be tedious to go back and forth between workspaces. Also, the LinkedIn group connector has been tricky to work with. If you could "post" or at least schedule notifications for when to post to Instagram, that would be helpful! Having to go between Social Studio and Radian 6 is a pain and would be better if it could all be in one place (Social Studio) and if you could customize the Social Studio dashboard rather than the predetermined graphs. Exporting to PDF rather than just excel in Social Studio would be great too. May not be worth the investment if you are only looking for publishing and basic analytics. Radian 6 is very powerful but may not be necessary for all users. The analytics have been helpful in seeing our engagement and growth. Radian 6 has also been helpful to see our place in the larger industry picture. "Powerful tool, but somewhat limiting for analytics"
The data Social Studio collects, and the tools available to you to interact with your followers are great. The best feature is the "Engage" dashboard, which allows you to setup and interact with followers in a custom workflow. The analytics are somewhat limiting - there are tools out there that allow for a user to customize the analytics and drill-down deeper. 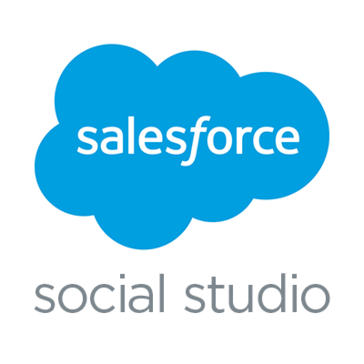 If you are on the Salesforce platform, Social Studio can tie into the platform and do great things. If you are not on the Salesforce platform, there are other, less expensive tools. We engage with our customers and followers using social studio, as well as monitor our industry for trends and conversations we can become apart of. "Pretty great for streamlining, but still has some issues." I love that we can post to all platforms in one space and that it allows tags. The easy to maneuver side tabs on the right are helpful to see each post's results. I dislike the connection with LinkedIn...you are able to post images and videos via social studio so we have to set reminders at scheduled times to manually post the content to LI. 3 different people work on our company sponsored content. These 3 different people are in all different departments so it allows us to be streamlined and strategic in our approach. It also allows me to generate content and get it approved by the supervisor without having to send emails back and forth. "Social Studio helps me organize our social media channels and spokespeople globally "
What I really like about Social Studio is that I am able to create so-called Workspaces. This allows us to organize our teams across the countries we are active in. I can easily add and remove users and channels. Employees who are using social media as part of their daily job ideally shouldn't have direct access to the actual page (and thus control it via personal login details) - ideally we would open the page centrally and give them access through Social Studio. But unfortunately the tool does not give us an easy solution for this. On a regular basis channels have to be reauthorized (and only the person who has registered the social media channel can reauthorize the channel). Learning about Salesforce Social Studio? * We monitor all Salesforce Social Studio reviews to prevent fraudulent reviews and keep review quality high. We do not post reviews by company employees or direct competitors. Validated reviews require the user to submit a screenshot of the product containing their user ID, in order to verify a user is an actual user of the product.